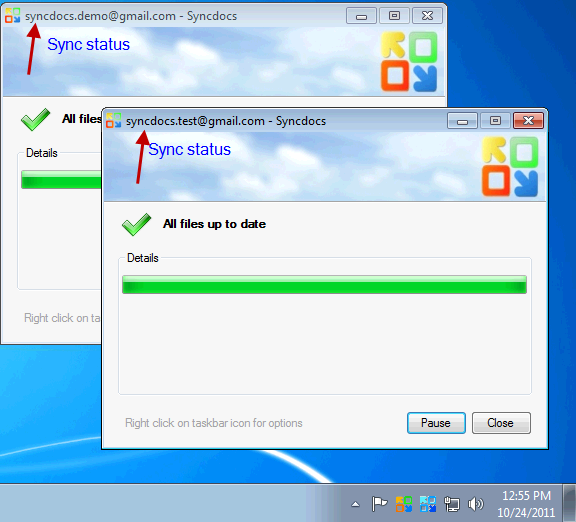 Syncdocs can work in portable mode. In this mode it keeps all your Google Drive files and Syncdocs program files on an external drive like a USB flash drive or memory stick. Using the desktop shortcut wizard or command shortcut to run in portable mode works fine for a single account from a flash drive. Open this file in a text editor like Notepad. Run this PortableSyncdocs.cmd file as usual to start Syncdocs in portable mode. You will see multiple Syncdocs icons on the taskbar, in various colors, one for each account, as usual.